6.30pm to 10.30pm, daily (dinner). 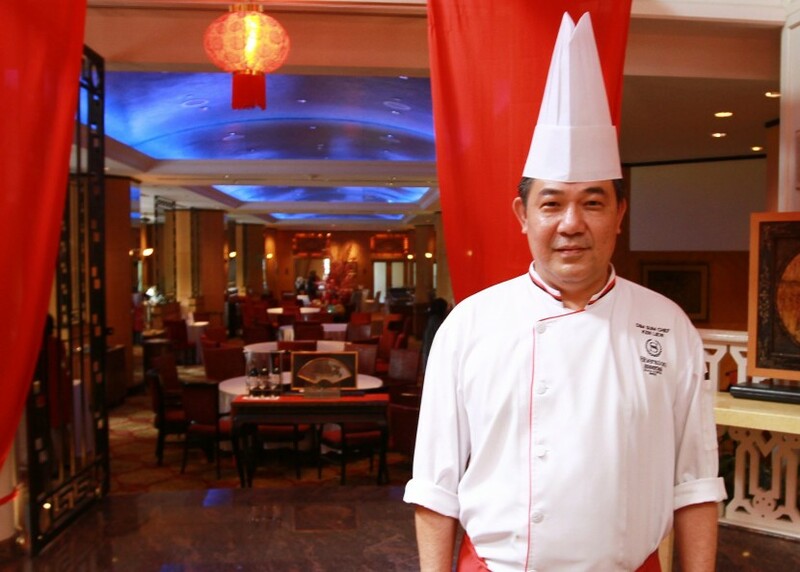 AS the saying goes, first impressions count and chef Ken Liew’s deftness in artfully creating tasty dim sum to appeal to the senses, makes it an attractive option for lunch. 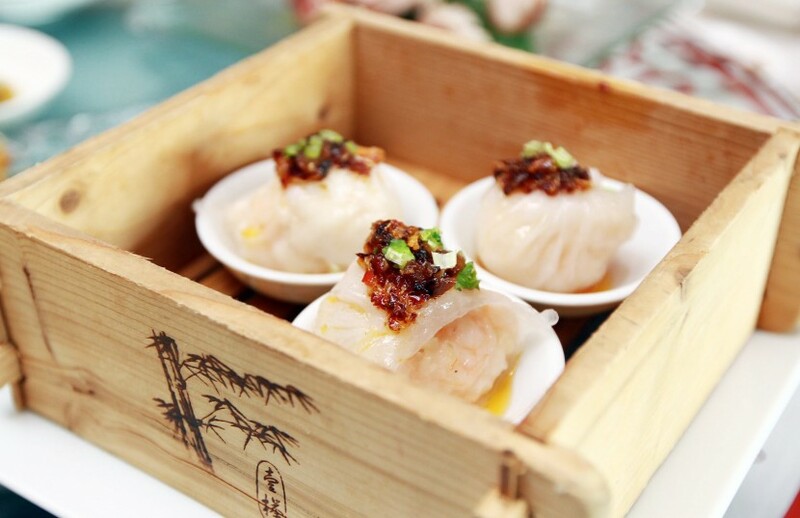 Its charming quality is that it deceives the mind into believing that one is consuming smaller portions of food, so the tendency is to pick more baskets of dim sum than necessary. What a pleasant surprise to be served individually plated dim sum for our dining pleasure at Celestial Court in Sheraton Imperial Kuala Lumpur Hotel instead of looking out for the dim sum carts. Not only had Liew put so much attention into prettying up the little morsels of goodness, the dim sum was also a lot bigger than the standard fare served at Chinese restaurants. The Celestial Court Jumbo “Har Kao” with Bamboo Pith topped with Truffle XO Sauce was the first to catch my eye. Eye for detail: Liew takes time and effort to make each dim sum attractive and tasty, so it leaves a lasting impression on the palate. It was simply not possible to pop the extra large dim sum into the mouth. When the dim sum was served, the obvious hint of truffle in this offering lingered in the air. Liew said it was common for Chinese restaurants to use XO sauce in their cooking but to make his sauce a lot more likeable, truffle oil and truffle were added to accentuate its taste. 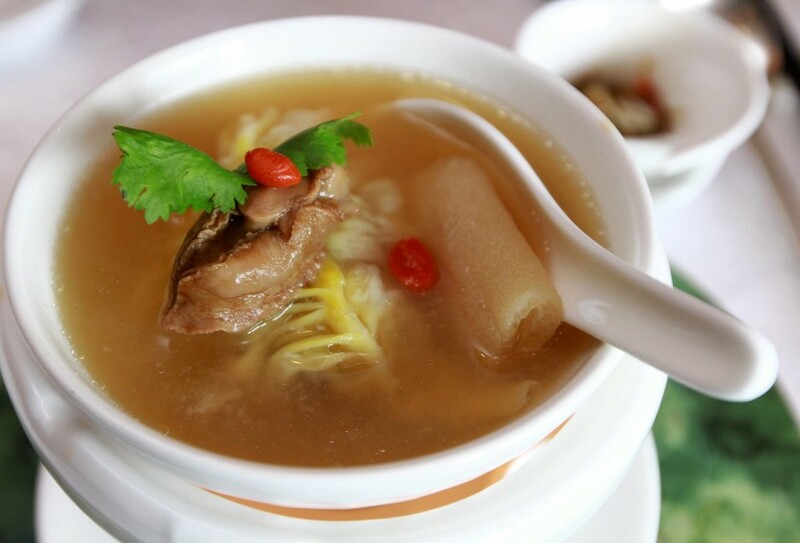 Prior to the har kao, Liew warmed up our appetite with rich Imperial Sea Treasure Dumpling with Abalone, Sun Dried Scallop served with Superior Chicken Consomme. This too, received my nod of approval because it was soothing and flavoursome, and after learning that it required seven hours cooking time, I relished every bit. 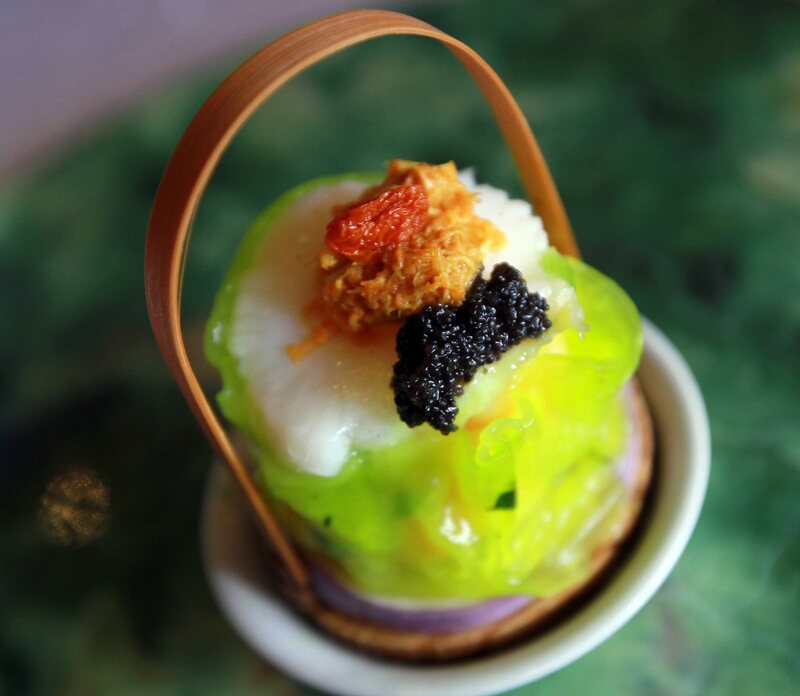 Liew’s Cod Fish and Prawn Dumplings served with Ginger and Spring Onion Puree, topped with Black Caviar was another charming treat. As good as it looks: The ‘Ham Tsui Kok’ made with Glutinous Rice stuffed with Crab Meat Filling is pretty to look at and tasty too. The seafood dumpling sat on a bed of ginger and spring onion puree, the combination of which was intriguing to the palate. While I found the intensity of the ginger and spring onion mix a little too strong, I overheard some other diners liking the marriage of flavours. A martini glass with Crispy Crab Meat Dumpling and Pumpkin Sauce revealed a pairing of savoury crab ball and sweet pumpkin that tangoed well together. Even in this speciality, Liew added a drop or two of truffle oil to pureed pumpkin with cream for extra thickness and flavour. If the dim sum served that day were vying for “the prettiest dim sum” title, the prize would have gone to the Crystal Spinach Dumplings with Lobster and Scallop topped with Curry Crab Meat and Tobiko (top pic). With a light green skin wrapped around the lobster and scallop, this delicate find arrived in little baskets with round slices of aubergine as the base holding the dim sum together. Eye-catching: Celestial Court Jumbo ‘Har Kao’ with Bamboo Pith topped with Truffle XO Sauce are bigger than the usual sized prawn dim sum. A close runner-up in my book for the title was the “Ham Tsui Kok” made of Glutinous Rice stuffed with Chilli Crab Meat Filling. Taste-wise, this particular item made quite an impression as it got my tastebuds wonderfully happy. Liew used a combination of glutinous rice flour and wheat flour to make the balls, with chilli crab meat filling, an interpretation of the famed Singapore Chilli Crab dish. “We use white and black sesame seeds to coat the glutinous rice ball for added effect and colour contrast,” said Liew who hails from Ipoh, Perak. 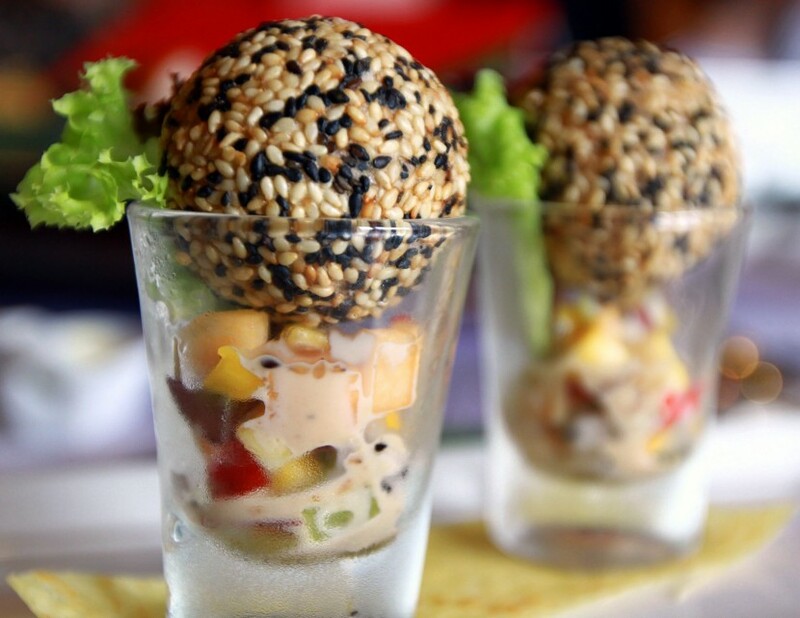 For Liew, there is no compromise when it comes to freshness of ingredients, especially seafood. Warming up appetites: Imperial Sea Treasure Dumpling with Abalone, sun Dried Scallop served with Superior Chicken Consomme at Celestial Court. “I love to cook with seafood because it is an incredible challenge and it takes skills to work with seafood. “The balance is all about preparing it without under or over cooking it,” said the chef who has two decades of experience in creating dainty dim sum. Before we ended our journey with the savouries, the kitchen brought out a bowl of Curry Wanton Noodle with Shrimps Dumpling and Assorted Vegetable. It was an interesting dish to savour as its strong and spicy flavours including the chunky seafood offering within, veered us off our dim sum adventure. After indulging in that nonetheless appetising dish, the Duo sweetened combination of Crispy Banana Fritters and Black Glutinous Rice Cream was a welcome sight as it helped douse the fiery effects of the curry noodle dish. Available during lunch only and priced from RM16++ per dish onwards, the new dim sum menu showcases Liew’s creative take on traditional and innovative dim sum. A la carte and set menus are also available, daily. This is the writer’s personal observation and not an endorsement of Star Metro.